Being the old fashioned type, Ol' Myrt here loves to make jams when the fruit is in season. Long time readers will perhaps recall my several jam-making blog entries. In this high-tech world, my busy girls wanted to learn how their great-gramma Myrtle managed to put up fruit. The "first fruits" of our labor last month. It's interesting how each generation chooses to embrace the traditions of the past while factoring in new options available as time marches on. Gramma Myrtle (1896-1972) grew up when preserving food was a necessity. 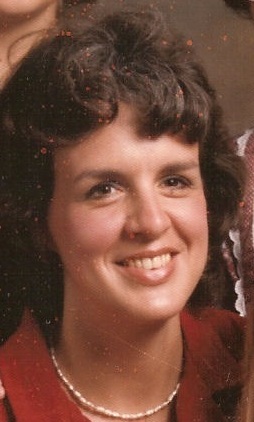 During her childhood they had a root cellar to preserve potatoes, cabbage, carrots, apples and such. Onions and garlic hung in braided bunches in the dry spot behind the kitchen's wood stove. There were crock pots (the non-electric type!) for pickled cucumbers and another (with glycerin?) to preserve raw eggs in their shells. (The latter in case the hens quit laying.) Home canning was a necessity, as store-bought canned goods were expensive and lacked the tastiness of home canned goods. I remember gramma making jams and jellies as early as the mid-1950s, when I was shooed out of the kitchen for fear I'd get hurt by the steamy hot water. Gramma raised her kids (my Dad) during the Great Depression, so she knew how to make a dollar stretch. As a young mother, I decided to can fruits, pickles, and tomato sauce for spaghetti. After all, it was the 1970s, and we were doing the Mother Earth, back-to-nature thing - eschewing all things unnatural like TV dinners and "Shake and Bake". I had a hand-cranked stone wheat grinder and a Foley Food Mill. I loved to make jam but didn't like the time it took to make jelly. Straining fruit to get the juice for jelly was just an extra step I wished to avoid. When we purchased our first home, there was a big old chest freezer (the kind that must be defrosted annually) so I learned to freeze my own ready-to-bake pies with the 1/2 slices of peaches that weren't pretty enough for those quart jars. (I also liked to prepare blackberry pies and apple pies.) It was fun pulling one out every other week or so throughout the winter. Baking pies makes the house smell so wonderful. Stacey, Carrie, Ol' Myrt and Tam at my Utah home. 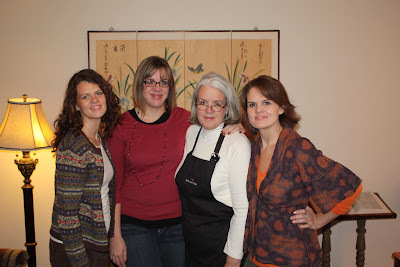 Now my daughters run households of their own (but amazingly, I haven't aged a bit!) They have fancy upright, frost-free freezers, buy things in bulk from Costco, and make sure my grandkids are served a full complement of nutritious foods. Tam has become a Master Gardener and tends great big square-foot gardening boxes on her acreage in northern Utah. Why they wanted to can peaches, I don't know. Maybe it was to control the sugar in the canning juice for two diabetics in the family? (We can now purchase peaches in light syrup, you know.) Maybe they couldn't pass up a good deal (46 cents a pound) on bulk peaches at the food co-op. I don't know. I wasn't going to worry, and I decided not to hold back or question their motives. Grandma Myrtle canned fruits and some vegetables, (some home grown, others purchased at the local farmer's market). Store-bought foods from the local Piggly Wiggly became the norm during her later life. She made wonderful sweet gherkins and also watermelon pickles. My mother shopped for convenience foods at the Super Giant on Rockville Pike, and used her free time to pursue gardening & decorating interests. I learned to grow my own veggies and make fruit leather, but settled for making jam and pies more than anything else. I now shop at Super Giant for fresh produce and lean meats. 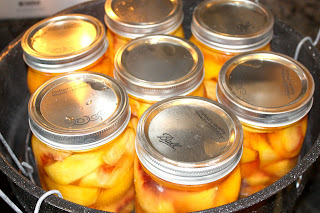 My daughters learned to put up peaches using the same water bath canner I've had for years. They bottled peach halves and made lots of peach jam, but elected to do more freezing than canning. They like to make healthy frozen fruit smoothies in their blenders for breakfast. Tyler's 1st day of pre-school 2010. I am thrilled that the food preservation"know how" (at least of the peachy variety) is getting passed down to this younger generation. It was a blast watching my grandchildren participate. The littlest, Tyler, kept reminding me to put the lid back on the jar of lemon juice. We'd shoo them outside, as my grandmother had shooed me, when it was time to pull the jars out of the canner. Of course I took a bunch of pictures, it's my thing! ;) By the way, I have a ton more views on my blog, I couldn't figure out why! Hehehe. My mom is down here in Utah visiting me from Washington and last week we canned peaches!! We got 30 quarts canned! I am probably the same age as your girls there and I can tell you I want to can because it feels great to see the fruits of my labor. I also like to know what my kids are eating! This week we will be canning applesauce and next week spaghetti sauce! Way to go Danielle! It DOES do a body good to see the food neatly lined up on the pantry shelves. And the concept of knowing just what your kids are eating is a big plus as well. This is so wonderful! Part of the magic, of course, is the stories you share while you're canning (and again when you eat it!). My husband is an urban farmer and he's been canning and pickling up a storm for months.